Watchman’s timeline is very short (24 hours), also its running time is just 95 minutes, but director Vijay has managed to pack a lot within this duration. The hero Bala (GV Prakash) finds himself in deep waters when he fails on his payment to a loan shark. In love with a girl (Samyuktha Hegde,) he becomes more and more hopeless when her parents visit him and fix a date for the engagement. Desperate times call for extraordinary action, and the hero decides that breaking in to a bungalow and stealing money is the way forward. Of course, if there’s anything we’ve grasped from burglary in the past, things never go as planned. A dog shows up in the bungalow and initially it comes across as a hindrance. 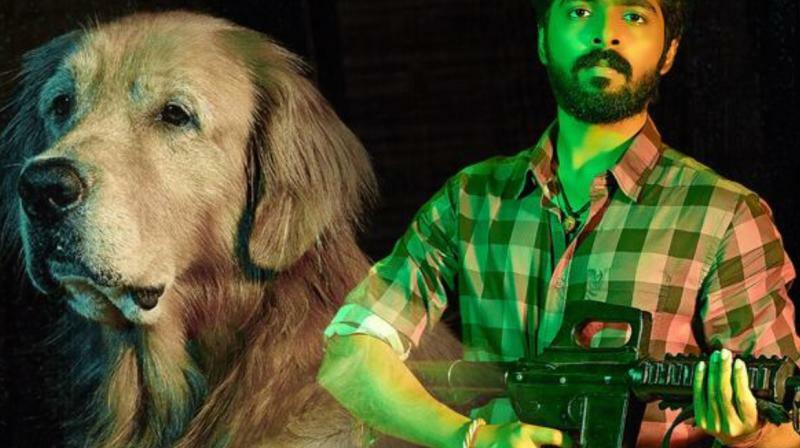 But the situation becomes much bigger than a quick grab for cash when he learns that a few terrorists right in this vicinity are chasing the canine’s master (Suman). With such a good setup, the director could have given an edge-of-a-seat thriller. Where the movie errs is in its execution and logic missing in few places. What starts off interestingly loses its steam midway and ends in a hurried manner. GV Prakash does a fine job in keeping things together, and Suman also does his part well. The well-trained Bruno (Golden Retriever) is cute and gives a neat performance. The rest including Yogi Babu don’t have much of a role. The cinematography by Nirav Shah and Saravanan Ramaswamy and intrusive music G.V. Prakash go well with the theme of the film.